Water—familiar, household H20—has a simple molecular arrangement, but this simplicity and familiarity disguise the fact that water is a rather peculiar substance. Hydrogen atoms within a water molecule are held to the oxygen atom by strong covalent bonds. The hydrogen atoms are grouped together on one side of the oxygen atom with a bond angle of 104.5°. Two electron pairs sit on the other side of the oxygen. This structure gives water molecules a strong polarity, with a positive charge on the side with the hydrogen atoms and a negative charge opposite to this, associated with the electron pairs. This dipolar nature creates strong intermolecular bonds between water molecules, as hydrogen atoms are attracted to the electron pairs of adjacent molecules. The resulting intermolecular hydrogen bonds are even stronger as a result of water's small molecular size, which allows close packing. Water molecules group in a tetrahedral form, which should produce bond angles of 109.5°. The strong repulsion between the electron pairs distorts this, producing a lower bond angle of 104.5° in the liquid or vapor phase and giving water molecules a "bent" shape. In the solid phase, ice crystals form from individual water molecules bonded in symmetric, hexagonal plate structures (figure 2.1). A number of different ice-crystal structures have been experimentally identified, but hexagonal ice (Jh) is the only structure that forms at the range of temperatures material properties of snow and iœ b.
material properties of snow and iœ b.
and pressures relevant to Earth's climate. Cubic ice (Ic) is found in ice crystals in the extreme cold temperatures of the upper atmosphere, where it can form at temperatures below 150 K. This structure is also expected at the low temperatures felt elsewhere in the solar system. More exotic, high-density ice structures have been experimentally produced at high pressures, but these are not found naturally on Earth. The hexagonal symmetry of ice crystals results from the tetrahedral bonds of H2o as water molecules freeze into a crystal lattice (figure 2.1a). In the solid phase, each hydrogen atom is still shared with an adjacent oxygen atom via hydrogen bonds, but the crystal lattice structure opens up to the tetrahedral bond angle of 109.5°. This results in an open, hexagonal planar structure. 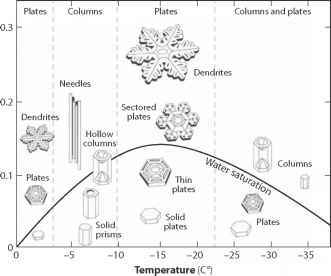 Snowflakes in the atmosphere are not usually initiated through spontaneous (homogeneous) nucleation. Supercooled water droplets exist to temperatures as low as -40°C, as the low vapor density and continual movement of the air makes it difficult for ice crystals to nucleate (compared with, e.g., lake ice that forms in water). At subfreezing temperatures, water in clouds consists of a mixture of vapor, supercooled droplets, and ice crystals, something known as mixed clouds. A surface for nucleation, such as pollen, dust, or another ice crystal, helps to seed ice-crystal growth. Where present, such cloud condensation nuclei provide a surface for condensation as well as deposition and greatly facilitate cloud development. Once nucleated, ice crystals grow in clouds through vapor deposition, as well as through collision and coagulation with other ice crystals. Because of curvature effects, the saturation vapor pressure over a plate-like ice surface is lower than that at the surface of a spherical liquid water droplet. This creates a favorable vapor pressure gradient that allows nascent ice crystals to outcompete water droplets with respect to vapor diffusion, and snowflakes grow at the expense of supercooled water droplets in a cloud. once a snowflake become massive enough, it drifts to the ground, commonly experiencing modification en route through collisions or partial melting. These processes often cause snowflakes that reach the ground to be rounded or fragmented, rather than the textbook dendritic, stellar crystals of figure 2.1b.